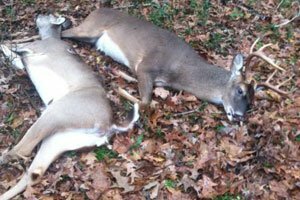 Michigan legislators want to raise fines to prevent poaching. Photo: Michigan Outdoor News. Grand Rapids, Mich. — Two Michigan senators want to send a tough message to poachers and wild animal traffickers in Michigan. They recently introduced legislation calling for tougher penalties and higher restitution paid to the state when a person is convicted of illegally killing, buying, selling, or possessing game or protected wildlife species. SB 244 is tie-barred to SB 245 and SB 246, introduced by state Sen. Dale Zorn, R-Ida. Zorn’s legislation establishes penalties for those convicted of the same crimes. Someone convicted of illegally killing, buying, selling, or possessing moose or elk would lose his or her hunting license for 15 years on the first offense, a lifetime on the second offense. A conviction for bear or deer would mean losing a hunting license for five years on the first offense, 10 years on the second offense. Only 3 years is specified under current law. Pavalov pointed to the success of his trophy deer anti-poaching legislation, which was signed by Gov. Rick Snyder in 2013 and took effect in 2014. It resulted in a number of large fines being issued to poachers. In January, for instance, a Riley Township poacher, Scott Malinowski, was ordered by the court to pay $15,510 in restitution to the state for the 18-point buck he killed illegally last November. It was his third buck that season. The prior law called for a flat $1,000 in restitution to the state. Pavalov’s anti-poaching law, Public Act 175 of 2013, requires a base restitution fee of $1,000 for any deer taken illegally with or without antlers; an additional $1,000 for any antlered deer; plus $500 per point for deer with eight to 10 antler point and $750 per point if it has 11 or more points. The anti-poaching package introduced in March was referred to the Senate Committee on Outdoor Recreation and Tourism, where Zorn is vice chair. The committee took testimony on April 22 from assorted conservation and sporting groups and the DNR. This entry was posted in Uncategorized and tagged Bears, Conservation, Deer, Deer Hunting, Elk, Hunting, Michigan Legislature, Moose, Poaching, Wildlife. Bookmark the permalink.